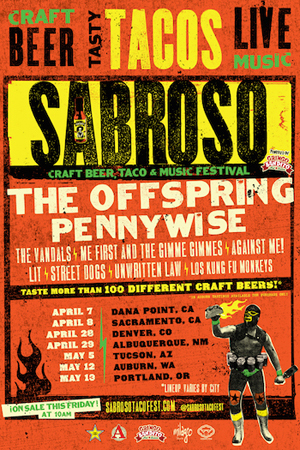 SABROSO CRAFT BEER, TACO & MUSIC FESTIVAL Expands To Include Events Across The Western U.S.
Synergy Global Entertainment (SGE) and Brew Ha Ha Productions are pleased to announce the expansion of the acclaimed Sabroso Craft Beer, Taco & Music Festival powered by Gringo Bandito to include additional dates in Sacramento, Denver, Albuquerque, Tucson, Auburn, and Portland during April and May of 2018. Sabroso also returns to the scenic Doheny State Beach in Southern California on Saturday, April 7 from 1:00 P.M. — 9:00 P.M. (VIP Entry at Noon). Each date of the 5th annual taco and craft beer celebration features a music lineup headlined by Orange County, CA-based THE OFFSPRING, along with SoCal's PENNYWISE. Me First And The Gimme Gimmes, The Vandals, Against Me!, Lit, Unwritten Law, Street Dogs, Los Kung Fu Monkeys, and more will perform on select dates. Visit www.SabrosoTacoFest.com for music lineup details. Produced by California's most successful and respected craft beer festival producer Brew Ha Ha Productions and premier music festival production company Synergy Global Entertainment (SGE), most dates of Sabroso will also feature craft beer tastings (until 4:00 P.M.) from some of the best breweries in the country. The region's top chefs and restaurants will serve delectable tacos and attendees can enjoy Lucha Libre style wrestling, lawn games, contests, and more. Beer tastings will vary by city according to local alcohol laws and restrictions. Dexter Holland of THE OFFSPRING said, "Tacos and craft beer are two of THE OFFSPRING's favorite things! We're excited to be bringing Sabroso to new cities in 2018! See you at the shows!" "Sabroso offers craft beer from some of the best, top-awarded breweries in the nation and pairs them with some of the tastiest tacos in the region. It's truly an experience unlike anything seen before," Sabroso co-producer Cameron Collins of Brew Ha Ha Productions said. "The festival will offer everything from savory carne asada and carnitas to delicious fresh fish tacos, and of course, craft beer favorites like IPAs, pale ales, stouts, lagers and more!" Avery Brewing, Pizza Port Brewing Company, Three Weavers, Abnormal Beer Co., Artifex, and Modern Times in Dana Point, New Glory Craft Brewery, Seismic Brewing Co., Heretic Brewing Company, The Bruery, AleSmith, and Avery Brewing in Sacramento, Oskar Blues Brewery, Melvin Brewing, Upslope Brewing Company, Renegade Brewing Company, Avery Brewing, and Great Divide Brewing Co. in Denver, Avery Brewing, Kaktus Brewing Co., Bosque Brewing Company, and Great Divide Brewing Co. in Albuquerque, The Shop Beer Co., Avery Brewing, Barrio Brewing Co., Crooked Tooth Brewing, Grand Canyon Brewing Company, and Stone Brewing in Tucson 7 Seas Brewing, Wingman Brewers, Avery Brewing, Harmon Brewing Co., Melvin Brewing, Silver City Brewery, and Wet Coast Brewing Co. in Auburn, Modern Times, Avery Brewing, AleSmith, Ninkasi Brewing Company, Ecliptic Brewing, and 2 Towns in Portland. At each festival date, the taco creations will compete for the coveted Sabroso "Best Of Show," awarded by a panel of highly acclaimed and pre-selected food judges. Attendees are also invited to sample all flavors of Gringo Bandito—Dexter Holland of THE OFFSPRING's top rated hot sauce—during the event. Lucha Libre style wrestling stars from across the globe will take to the ring battling for the title of Sabroso Champion. There will be multiple qualifying wrestling matches throughout each festival day and one final championship match at each show. Sabroso Craft Beer, Taco & Music Festival powered by Gringo Bandito runs from 1:00 P.M. — 9:00 P.M (VIP Entry at Noon). Tickets for all dates of Sabroso go on sale Friday, January 26 at 10:00 A.M. local time at www.SabrosoTacoFest.com and start at just $29.00 in some markets and $39.50 in others. For each ticket purchased, $0.50 will be donated to a charity in the local festival market. The VIP Lounge + Early Entry Ticket includes (1) festival admission ticket with craft beer tastings, music festival access, VIP entry lane with one hour early entry for craft beer tastings (21+), VIP lounge access with exclusive craft beer tastings and special taco vendors, VIP bathrooms, and VIP commemorative laminate. * THE OFFSPRING and PENNYWISE perform at every show. Support lineups vary by city. At last year's sold out Sabroso Craft Beer, Taco & Music Festival powered by Gringo Bandito at Doheny State Beach in Dana Point, CA, 8,500 attendees gathered under the California sunshine for an afternoon of complimentary craft beer tasting with over 40 of the best breweries from Southern California and beyond, gourmet street tacos and more. Lucha Libre style wrestlers competed throughout the day as the waves of the Pacific crashed behind their beachside ring, and professional eaters, including world champion Takeru Kobayashi, took to the stage before THE OFFSPRING's performance for the 7th Annual Gringo Bandito Chronic Tacos Challenge. While runner-up Molly Schuyller, European champion Jesse Pynnönen, and others devoured tacos at an astonishing pace, Kobayashi stole the show by downing 159 tacos in 10 minutes — shattering his own 2015 record of 144 tacos. Sponsors for Sabroso Craft Beer, Taco & Music Festival powered by Gringo Bandito include Gringo Bandito, Avery Brewing, Rockstar Energy Drink, Chronic Tacos, Milagro Tequila, Cosmic Fog and many more.